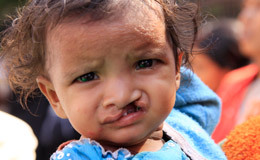 Every year more than 170,000 children in the developing world are born with cleft lip and/or palate. Most can't afford surgery. Clefts are a major problem in developing countries where millions of children are suffering with untreated clefts. Most cannot eat or speak properly and aren’t allowed to attend school or hold a job. Being born with a cleft in a developing country is truly a curse. Every baby born in Uganda with a cleft is given the name Ajok which means literally, “cursed by God” with some newborns killed or abandoned right after birth. The good news is every single child with a cleft can be helped with surgery that costs as little as $250 and takes as little as 45 minutes.